So when it came time to sprucing up our landscape I had no idea what I was doing. Looking back, I should of taken my Aunt's advice and gone to a nursery and had someone help me plan out the yard and then just of done it ourselves, but Paul thought it would be fun to just wing it and do ourselves without much research so we did just that. It is by no means magazine worthy, but we have been having fun experimenting and learning so that's all that matters. 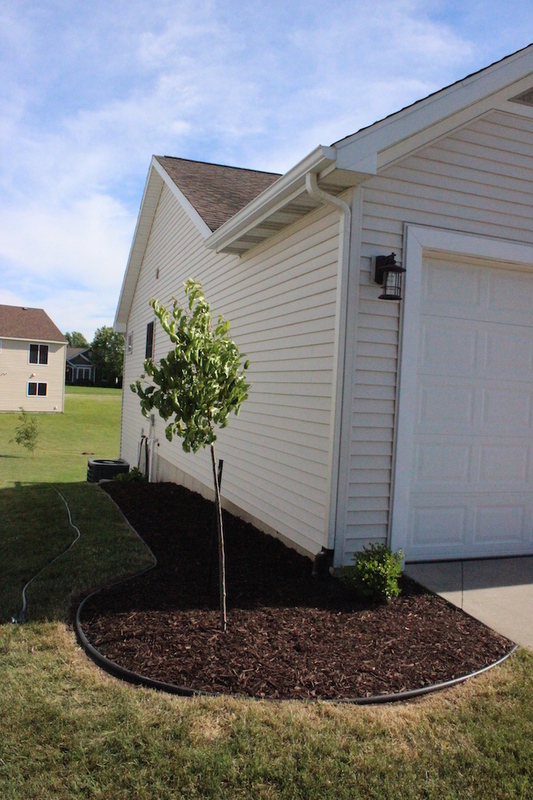 Last spring we began by removing all of the existing plants except for the magnolia. 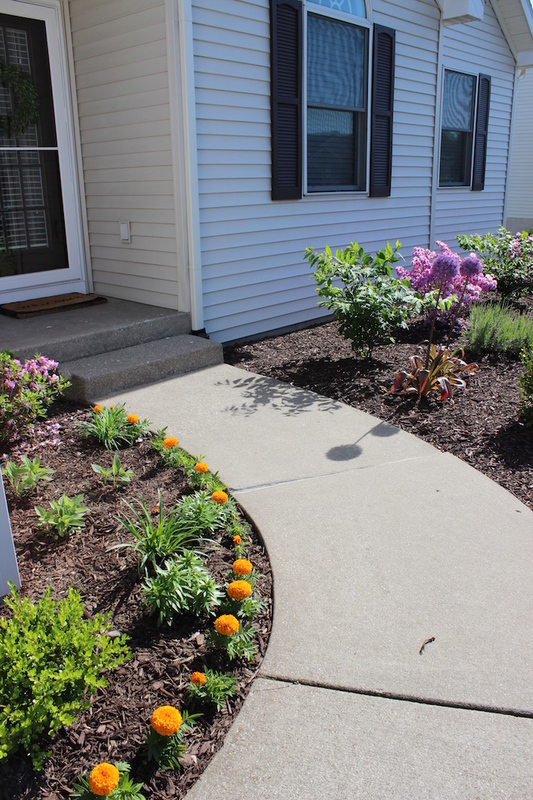 We put the pink hydrangeas that were up front on the side of the home, and moved the azaleas that were behind our house up front in hopes to save them since the front gets much less sun. 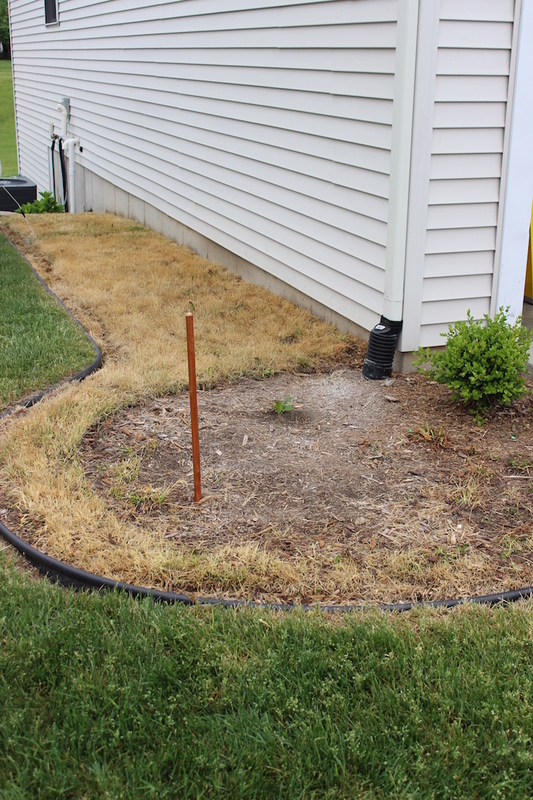 Although we knew VERY little in landscaping, one thing we did know from observing other yards was that bigger items tend to go in the back and the smaller things up front so we tried to do just that. 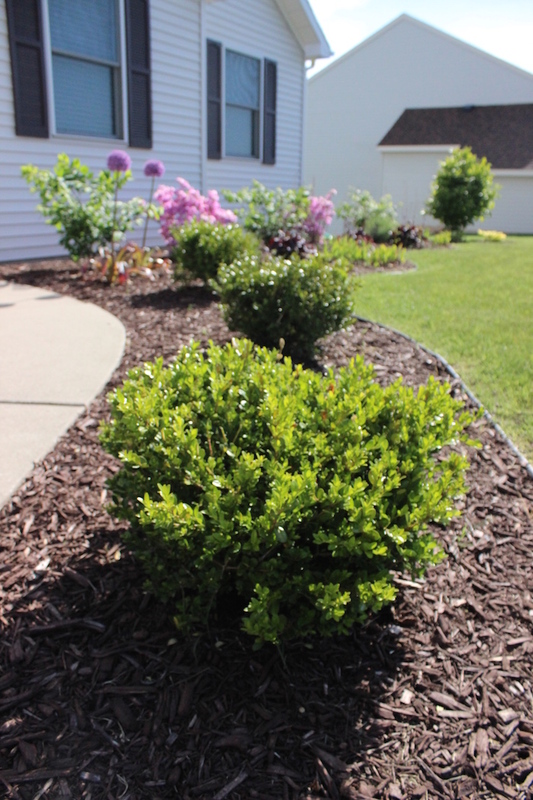 We got some burning bushes as well as some boxwoods and played around with their placement. 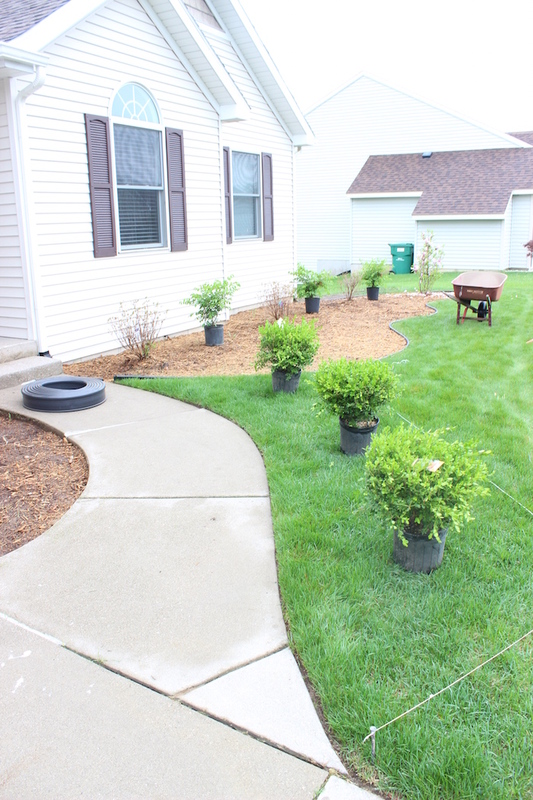 We decided that we wanted the landscaping to curve along the side walk, so my very handy husband ripped out some of the existing grass and added new edging. The image is a little distorted because while Paul worked as it was drizzling outside, I was inside my office snapping pictures. 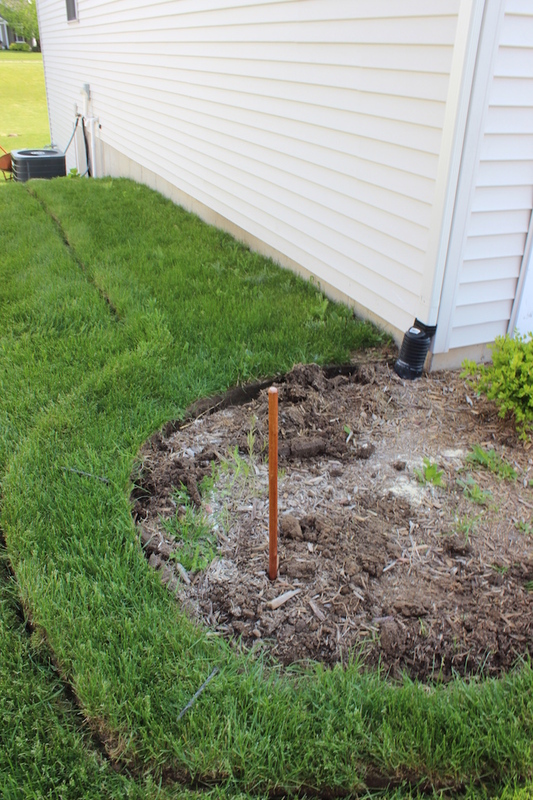 Here is after those bushes were planted. 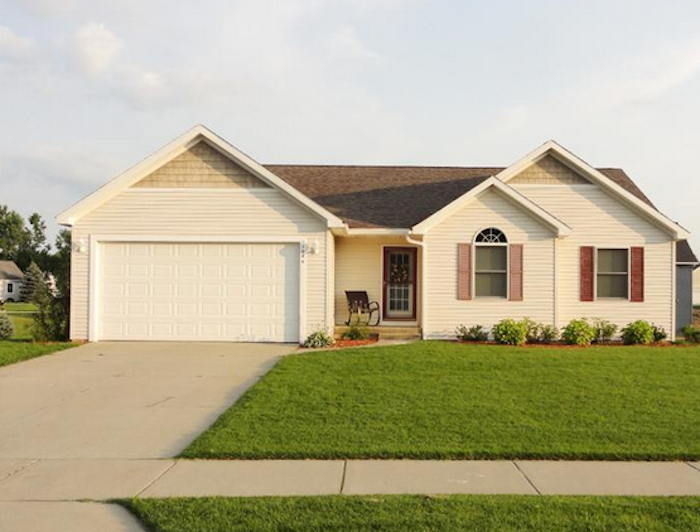 In addition, we replaced the red shutters with brown ones and painted our door and storm door brown and off-white to better go with the house. We also replaced the numbers on our house and got new garage lanterns. Fast forward to this summer, and here is how the landscape is now. I'm pretty sure we will have the most colorful yard on the street once everything is bloomed. What can I say, I love flowers! 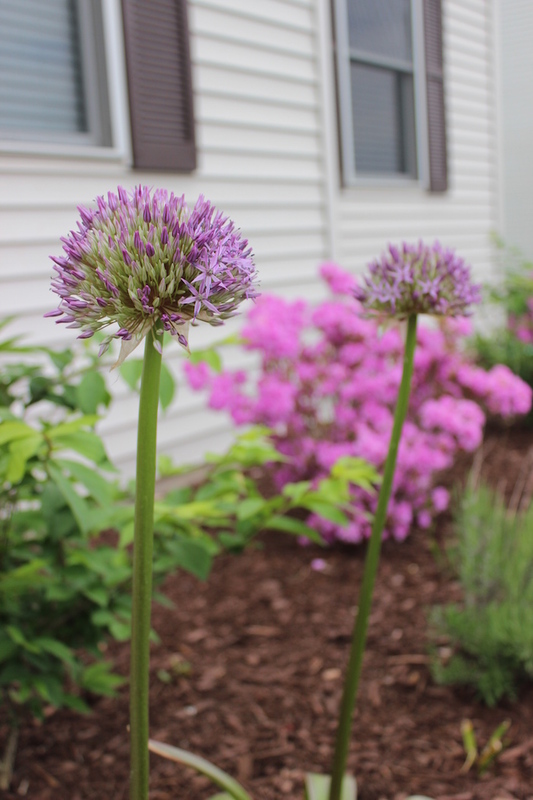 My favorite additions probably have to be these globemaster alliums that I picked up in the fall at Costco. They were pretty expensive so I planted just two to make sure that they bloomed, but I plan on getting more in the fall. 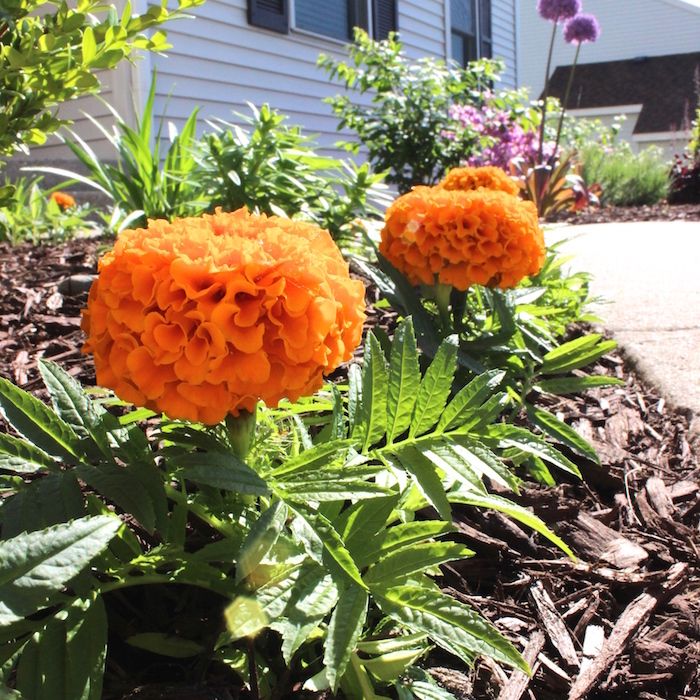 Last year we also planted black-eyed susans and some sort of lily in this flower bed, but the rabbits ate them so this past weekend I planted marigolds because I’ve heard they keep the rabbits away. Fingers crossed that it works! On the left side of our house, we just began working on it this past weekend. My favorite flower are hydrangeas so I’ve been telling Paul since we’ve moved in that I want a place to grow a lot of them so that I can have my own supply that I can cut and bring inside the house during the summer. The side of our house is perfect for that because it gets morning sunshine which I’ve read is good for them? I have yet to plant the hydrangeas yet, but hope to find some nice white ones and plant them this weekend. So far we’ve killed off the grass using roundup and Paul added edging to define the space. In addition, we’ve moved the tree that was in our backyard to up front because I was feeling like we needed something tall in our landscape. I’m hoping the hydrangeas work out, if any of you have any suggestions on how to plant them or types of hydrangeas with white blooms I’d love to hear in the comments section! So that’s it! Nothing too fancy, but it’s been fun getting into gardening and we like the progress we’ve done so far!